For gem, mineral, and fossil lovers around the globe, the annual Tucson, Arizona gem and mineral shows in early February are the highlight of the collecting world. 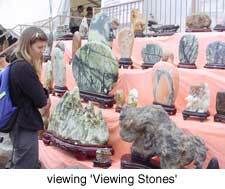 Thousands of dealers display their 'wares' at around 20 different wholesale shows located throughout Tucson and set against the backdrop of the Arizona desert. 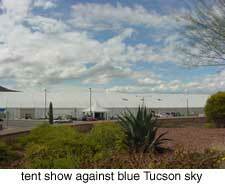 Approximately one million buyers and sellers attend this Wild West show each year. The shows take place in a variety of venues- a convention center, hotels, motels, tents, parking lots, and this year, even out of the back of U-Haul parked on the side of the road (selling fossil mammoth ivory from Fairbanks, Alaska). Hotel reputation has nothing to do with the quality of gem materials being sold inside. Each show has a different flavor, from fine mineral crystal specimens at the Holiday Inn Express to fabulous fossils at the Days Inn to large, rare precious gems within a very secured convention center. 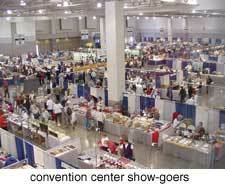 The booths and venues vary tremendously. One booth might have only extremely fine gems, with over 20 millon dollars of inventory displayed, while another will have much less expensive inventory, with only $100,000 to be seen. However, you never know which booth will have the perfect gem or the best bargain. 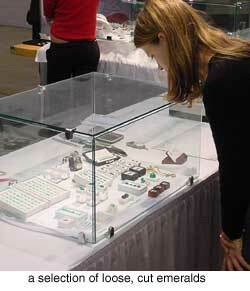 The gem shows are the ideal time to find high quality gemstones and pearls. These exceptional loose materials- whether for color, size, rarity, cut, or a combination of these qualities- are mixed in with an abundance of lessor quality pieces. In some ways, the old expression 'looking for a needle in a haystack' comes to mind. I may examine a hundred different gems before I find a stone that really stands out to me and will make an exceptional piece of jewelry. Certain nuances of color, variations in cut, small defects, or even variations in shape can make all the difference between a fine stone and an average one. Hunting for specific client gems/ materials is a challenge during the shows. 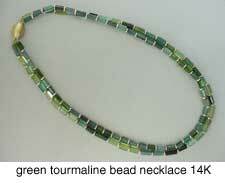 For example, one client had requested an aquamarine for a pendant. The right size, shape, and hue of color were all important to the finished piece, so armed with her request, I personally examined around 120 different aquamarines, and excluded them, before I found the very best one and bought it. While the selection is vast and I see an impressive array of gems, a great deal of time, patience, and training is required to select superior individual materials for a reasonable price. 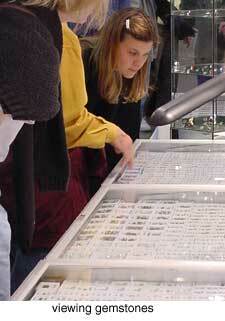 Many large jewelers do not have the patience nor take the time to do this. Part of the excitement and creative drive experienced in Tucson is when I locate a fine material and recognize its jewelry potential. 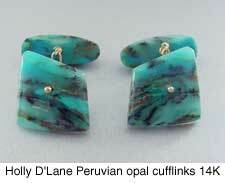 This can be a finely cut gemstone, a domed cabochon of Peruvian opal, or even polished dinosaur bone. For the first time show-goer, the selection can be overwhelming. 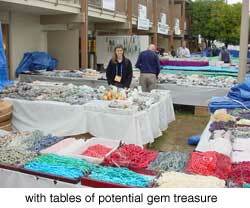 The gem shows have a feeling of a flea market. Gems are in cases, rough materials spread out on tables, and people, both buyers and sellers, are wearing casual clothes with comfortable shoes. Persian rugs, rock sculptures, scientific equipment and tools, and even African masks are mixed in with pearls, gems, and fossils. Price negotiation is the order of the day. The selection is colossal. Looking to buy a meteorite, a rare color-change alexandrite, a large rough emerald crystal from Colombia, a jade flute, or a fossilized dinosaur egg? 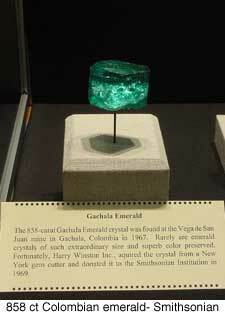 During the gem shows, you can find it. You may be competing with a private Swiss collector, a rock hound from Wyoming, or the Smithsonian for the finest pieces, but if you are looking for the best, the pieces will be available in Tucson. 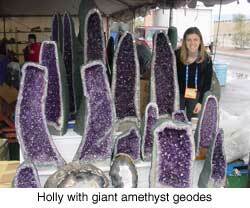 New gem and fossil finds generally make their debut in Tucson. You never know what treasure you may find from one year to the next, so it is important to keep abreast of the gemstone market. Bold, vibrant-colored gemstones prevailed at this year’s shows. 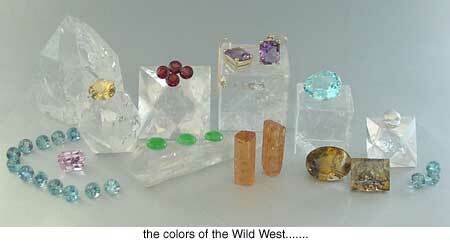 I observed a wonderful range of larger, well cut, colored gemstones. Color is the most important factor for assessing a gem’s beauty but a great cut enhances every aspect of that gem’s appearance. Brazilian aquamarines and tourmalines were enticing in an array of colors- rich blues, hot pinks, deep greens, and minty pastels. Freshwater pearls from China continued to range broadly in quality with the largest supply available in poor quality and the finest quality scarce. Beautiful turquoise and coral pieces struck an eye-catching contrast. 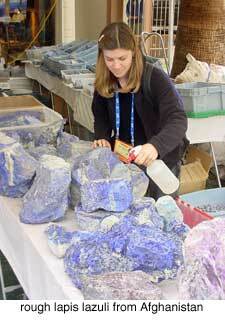 I noted an ample supply of rough lapis lazuli from Afghanistan. I also noticed this year that demantoid garnets, while mostly smaller in size, were in greater supply than usual due to a more recent discovery of material in Africa. Demantoid garnet is a fairly rare variety of garnet known for its green color and dispersive property (which breaks white light into sparkling rainbow colors even more so than in diamonds). 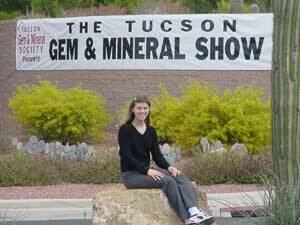 After two weeks of assorted gem shows, the Tucson convergence of global rockhounds culminates in a four-day gem and mineral show sponsored by the Tucson Gem and Mineral Society. 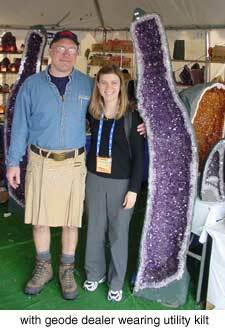 In its 49th year, this organization is responsible for what has become the Tucson gem and mineral show extravaganza. 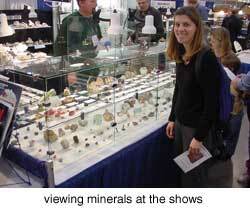 Each year the society selects a mineralogical theme and places specimens on display for public viewing. 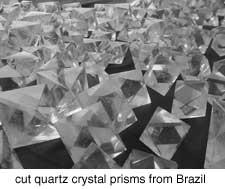 This year, the show theme was ‘Minerals and Gems of the Andes’ with specimens from private collectors and museums all over the world on loan and display. In the collecting world, many of the finest pieces are in private hands since museums often cannot afford to buy them. 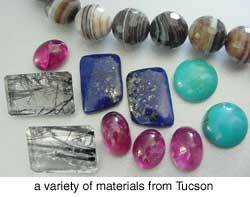 During the Tucson shows, almost any gem, mineral, fossil, or crystal on display can be purchased- for the right price. The experience is like shopping in the world’s museum. The only question is- what to buy next for one's collection?